To provide the gaming experience available, Game Accelerator is an all-in-one game optimization tool that allows you to run your games at the best possible performance by eliminating the performance and stability problems that make your games run slower than they should. This is done through easy one-click menu options that allow you to tailor your games to run faster based on your system hardware. ...... The combination of optimization techniques used by Game Accelerator help significiantly improve your gaming experience, turning your computer into the ultimate gaming machine. Furthermore, to make your overall computer experience even smoother, an intelligent pop-up ad blocker is included to block those annoying spam pop-up and pop-under ads, as well as an easy-to-use system monitor taskbar that allows you to keep track of your computer's health. -Stylish system monitor taskbar that allows you to keep track of your computer's health. Qweas is providing links to Game Accelerator 4.9 as a courtesy, and makes no representations regarding Game Accelerator or any other applications or any information related thereto. Any questions, complaints or claims regarding this application Game Accelerator 4.9 must be directed to the appropriate software vendor. 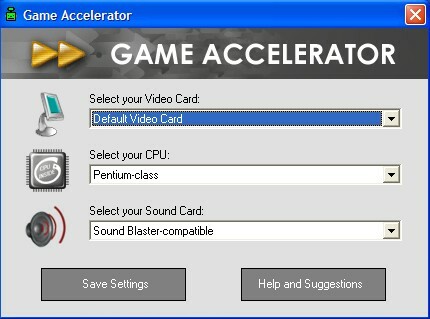 You may click the publisher link of Game Accelerator on the top of this page to get more details about the vendor.